Want to get your AWS account notifications on Slack? Here's how to set up a CloudWatch alarm that contains all the data you need with AWS Lambda. 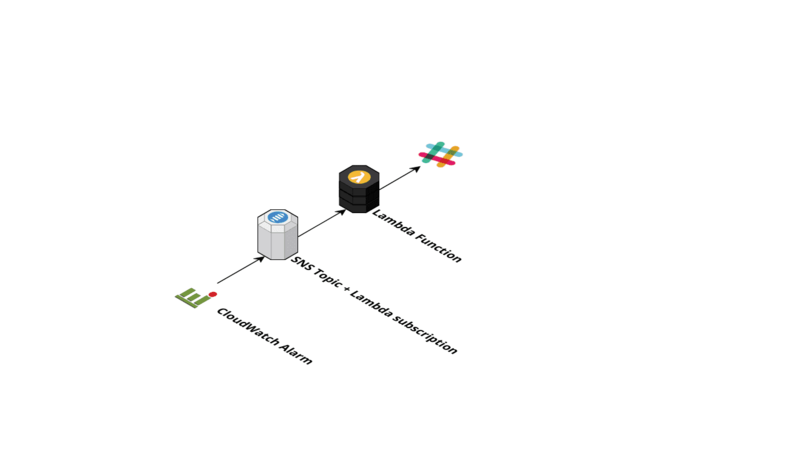 To deploy the components in the figure, you will use the Serverless Application Model (SAM). If you are not interested in implementing this on your own, give our Slack chatbot a try. Never miss an alert from your AWS infrastructure with marbot! You will use Node.js to implement the Lambda function. To send a request to the Slack API, you have to make an HTTPS request. The request module is easy to use, but I wanted a variant of the module that returns promises to avoid callback hell. That’s why I used request-promise-native. The Slack webhook URL is passed in as an environment variable that you define later in the CloudFormation template. You need to convert the format into the Slack message format. Now, you will use SAM and CloudFormation to define the AWS resources. SAM handles the SNS subscription and also takes care of IAM roles and Lambda permissions. That’s it. You can find the full source code on GitHub. Now you can deploy the solution. You are redirected to a new page where you can see your Webhook URL. Copy the value; you will need it soon.